Size: Plate is 11.5 inches tall! This is a fabulous multiple crinoid plate from Gilmore City, Iowa. This legendary location has not seen much collecting since its heyday decades ago. We acquired this piece unprepared, then cleaned it using modern techniques under a microscope. There are 24 very detailed crinoids on this piece including Eretmocrinus tentor, Dichocrinus multiplex, Aorocrinus iola, and others. MANY of the crinoids are complete with their LONG stems intact, which is extremely unusual. 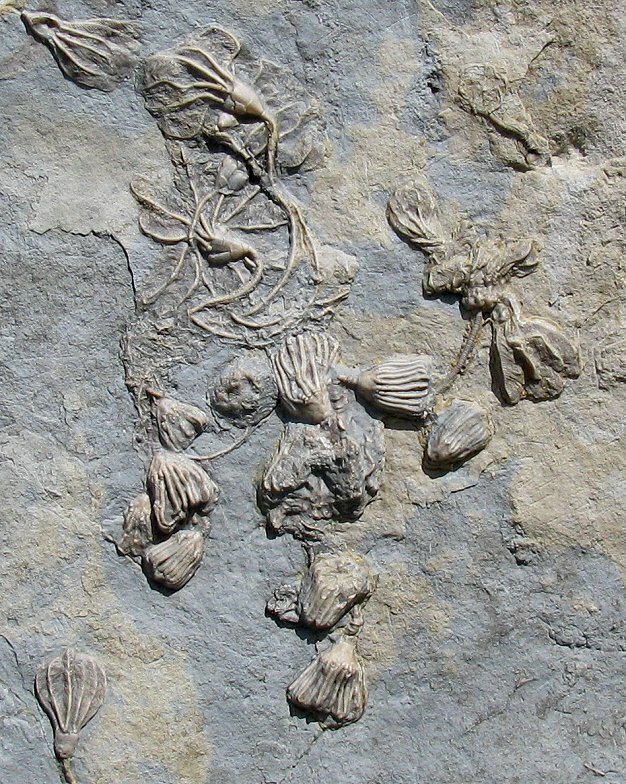 The fossil echinoderms have great natural color and strong contrast and are beautifully clustered on the large, natural plate of limestone that also has a blastoid(?) preserved. This is one case where the photo does not do the fossil justice! This is easily one of the best display plates we have seen from this classic locality.